This Crayola logomark redesign brings out the playful and creative values of the company. The octopus was inspired by the company’s mission statement, and the different arms help to showcase the different products that they sell. This logo was successfully created with the pen tool and an underlying grid system using Adobe Illustrator. Crayola currently has a well recognized logotype that consists of a bold, curvilinear typeface. For their rebranding I wanted to create a logo mark that incorporates every aspect of the company. The mark helps explain to outside consumers what the company sells and who their target market is. It was important to keep the logo consistent with the current style that the brand had developed, while adding awareness to the different products that the company has to offer. The logo also needed to be simple enough to be decipherable when scaled down in size. 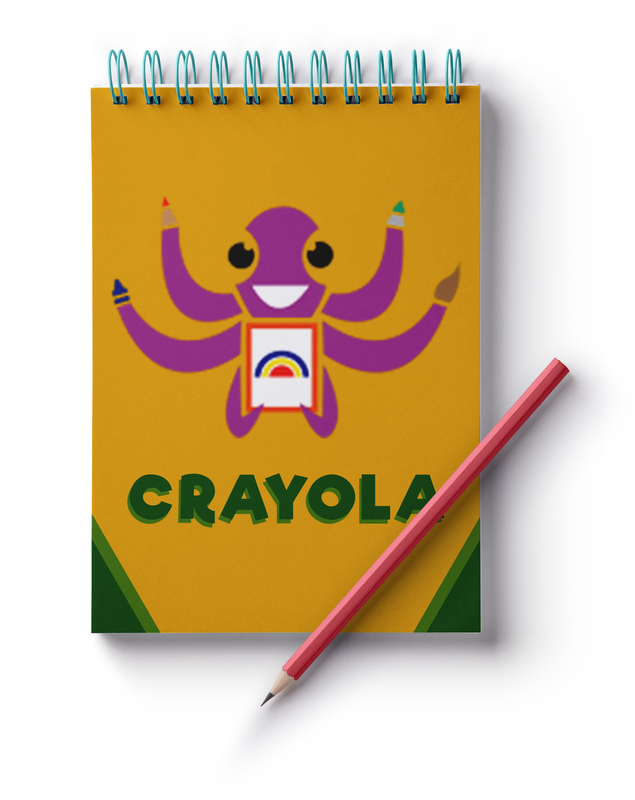 As stated above, the idea to use an octopus as the new logo for Crayola stemmed from their mission statement. “Whether it’s providing tools to put a purple octopus on the moon, or enabling teachers to bring arts-infused learning into the classroom, Crayola is passionate about helping parents and educators raise creatively alive children who we believe will grow to be inspired, original adults.” I wanted the new mark to stay true to the company while still bringing awareness to the different things they had to offer. Most people think of crayons when they think of Crayola, but Crayola sells many different products. Since an octopus has many hands, it gave me the opportunity to showcase different products they have to offer. Using an Octopus as a mascot also helps to attract children who are the driving force for the parents to purchase the products. This also opens the opportunity to create products such as stuffed animals of the mascot. This helps in increasing brand awareness, as well as adding a new asset for the company to profit off of.